The Kapihan sa Dipolog has recently put together a panel of discussants which tackled a wide-range of issues and concerns affecting labor and employment with strong emphasis on rights and obligations of workers and employers. 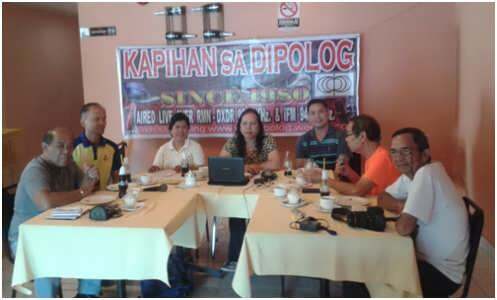 Kapihan sa Dipolog-the longest-running public service talk show which is aired over Radio Mindanao Network DXDR and can be seen over streamlined youtube presentation was held at Camilla 1 Hotel, Gen. Luna Street, Estaka, Dipolog City last February 21, 2016 and was mainly hosted by veteran media practitioner Mrs. Edith Pagente-Tomong. 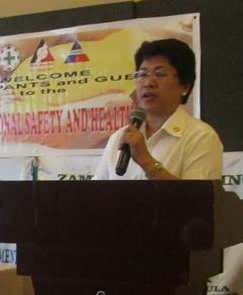 The core of the discussion was the inter-agency implementation of R.A. 10361 or the Batas Kasambahay Law which eventually crystallized a public advisory that household workers may file a request for assistance withthe nearest DOLE-Office should they encounter any employment-related problems. Among the show's guests were Mrs. Lourdes B. Amores, head of DOLE-Zanorte and Mr. Cyrus P. Tingcang, Labor Laws Compliance Officer of the same office. Investment Officer, Mr. Julius Salaveria from the Department of Trade and Industry Provincial Office also chipped-in during the discussion by stressing, among others, that DTI is now leveling up its promotion campaign on entrepreneurship. Atty. Roseller Barinaga who is the show's regular panelist provided his legal insights on various topics deemed beneficial to both workers and employers. Also in attendance were Mr. Alfonso Rodaof the Philippine Information Agency Provincial Office and Mr. Edgar Sorronda who is known media personality in Zamboanga del Norte. Mrs. Amores said that DOLE-Zanorte continually promoted programs and projects designed to safeguard the welfare of our household workers. She added that a skills training on food preparation was successfully conducted last February 20, 2016 in line with the Department's aim to uplift the living conditions of said workers and as part of anniversary celebration of the passage of Kasambahay law.